Marshall's Memory Oregano (on the right) is one of the longest blooming, most prolific, best drying ornamental oreganos we have ever grown. A very tough, well behaved oregano that has proven itself to be a great asset to the garden as well as to our dried flower arrangements. The lighter pink flowered oregano pictured with Marshall's Memory above is our wonderful Showy Pink Oregano. Here the bright green early spring growth of Marshall's Memory Oregano combines with the cloud of blooms on our Italian Oregano Thyme (to the rear) and newly emerging daffodils. 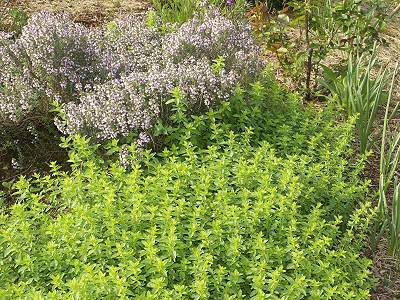 By early summer, this patch of Oregano will be covered in deep purples and pinks. Harvest when most of the flowers have colored but before any browning of the flower bracts start to appear. Marshall's Memory Oregano would make an excellent addition to our Crafter's Herb Garden Six Pack. This plant is sometimes available in plug trays. These trays hold 128 of all the same plant. They are a great low cost way to fill a lot of space. Each cell is 3/4 of inch by an inch. Check here to see if Marshall's Memory Plug Trays are available.